19 November 2016 – On Election Day 2016, Donald Trump shocked the world with his defeat of Hillary Clinton for the American Presidency. One thing seems certain, that this has been the most divisive election anybody can remember. However, I believe people are focusing on the wrong thing. Rather than focusing on how bad or good of a president Trump may be, we should be focusing on the reasons why he was elected in the first place, for in doing so some very serious structural deficiencies within our economy become clear. Trump is but a symptom of a disease, and only once we diagnose the disease can we cure the country. Through this essay, my aim is to show that there are two Americas – rural and urban – one that has been in a recession if not depression for nearly a decade, and one that has not. The establishment has been ineffective in addressing the urgent needs of those in Rural America, and as such this establishment has been rejected by a geographic majority of the country. I submit that the economy is the driving force behind Trump’s ascendancy, that Trump is but a symptom of a larger disease, that the “Trump Phenomenon” is not limited to just the United States, and that the true Mistake that is Trump is not the man himself per se, but our inability to proactively solve deep problems that, if left long enough, will fix themselves through violent dislocation. Finally, I will provide my predictions on what happens from here. As the pundits, our government officials, and the mainstream media would have us believe, the economy is doing great. Within just a few days leading up to Election Day, The Huffington Post proclaimed, “U.S. Economy in Record 73-Month Streak of Job Growth!” Unemployment is down to 4.9% and job creation has been a straight line up (see right). 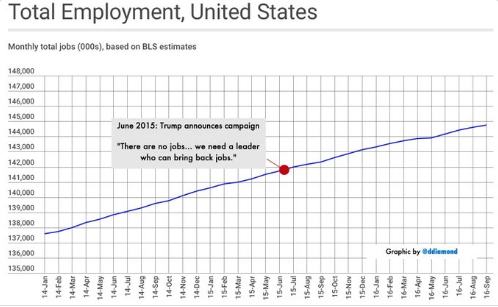 The author even places a red dot in the middle of that straight line where Trump said, “There are no jobs… we need a leader who can bring back jobs,” clearly intending to suggest that Trump has gotten it wrong when it comes to jobs. But has he? But that still doesn’t explain the low 4.9% overall unemployment rate. To answer that question, one has to ask how the Bureau of Labor Statistics (BLS) even makes that calculation. If you visit the BLS’ own website for the answer, you’ll get a document that requires 11 pages to print. That’s because over the years the statistic has become perverted and overly complicated. How about just answering the question, “How many people who can work actually have jobs?” To answer that question, the best metric is actually the labor force participation rate, which simply measures the percentage of working-age people who are employed. In looking at the chart, one can see employment peaked just before 2000 and now sits at a level not seen since the late 1970’s. This is a vastly different story than the 4.9% unemployment headline would have you believe and, as has been demonstrated above, a disproportionately large portion of these declines is coming from Rural America. It’s a safe bet that those who live in Rural America don’t care how well the stock market is doing. They care about the real-world economy because that’s where they live and operate. That economy is sick, has been sick for a while, and shows negligible signs of improvement. As of December 2015, I went on record with friends and family saying that I thought Trump would become the next president, not because I thought he was a good choice but because there were a lot of Americans out there who were hurting economically and had become desperate for someone – anyone – that wasn’t an establishment politician. This, I argued in my March 2016 essay entitled The Coming Revolution, was the reason Donald Trump and Bernie Sanders were doing so well. They both carried a non-establishment, populist message that was resonating with pissed off Americans desperate for change. [14, 15] Clinton Managed to defeat Sanders (albeit controversially), but one by one Trump’s challengers dropped. What they didn’t realize was the more they attacked Trump, the more they dug themselves into a hole. What’s more, not only did the Republicans fail to see what should have been obvious, the Democrats also failed by running their “most establishment” candidate possible against him. This all suggests that poor and rural voters overwhelmingly preferred Trump, even among women, and race did not really play a role. In contrast, among voters earning more than $100,000, more voters moved from Republican to Democrat. Again, the poor can be seen going for Trump and the rich going for Clinton. Turns out the economy “Trumps” everything. Much press has also been given to the ongoing debate over the modern-day validity of the electoral college. The argument against the electoral college is that it is unfair to both the candidates as well as the population when a candidate earns a majority of the votes but is denied the victory. At face value, this makes sense. However, the Founding Fathers took seriously the topic of “tyranny of the majority” and that the president would need to be responsible not only to a concentration of people living in the major cities, but to a wider populace that covers great geographical and cultural distances. Therefore, the Constitution was written to divide power not just between individuals, but also geographically across the states within the Union. 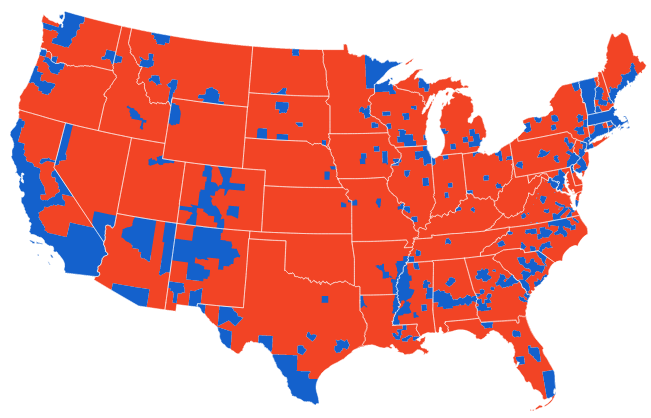 Had the 2016 election been decided by a popular vote, the map at right shows who would have decided that outcome. Although the electoral college system may not be perfect, one could argue that in this case it may have functioned exactly as the Founders intended: to disallow the statistical majority from silencing the voice of wide swaths of the American population and culture. Rural America has made its opinion clear: it is sick and tired of being failed by establishment politicians who continue to promote policies that further impoverish the poor. Since the end of the twentieth century, employment has steadily been declining, disproportionately impacting Rural America’s blue collar workers who made their livelihoods in manufacturing. Furthermore, Congress and the Federal Reserve Bank have implemented economic policies that have led to an even bigger wealth divide than that which preceded the crash of ’29 and the Great Depression. Although Urban America believes it has recovered from a recession, the recession never ended for Rural America, and these voters have cast the ultimate protest vote against the establishment. Moving forward, real-world economic indicators suggest the fundamentals of the economy are still in decline, meaning the only thing left to fall is the financial markets. When this happens, Urban America will be pulled back into recession – possibly depression – right alongside Rural America. In short, what we have been witnessing in America has been but one piece of a larger movement. In much of the developed world, a populist anti-establishment message is taking root among the working classes and people are voting in protest of a system that has been slowly strangling them. In my September 2015 essay entitled Held at Gunpoint by Income Inequality, I predicted that “as people lose faith in government, they’ll increasingly turn to oddball fringe candidates to save the day.” This has certainly played out in the US and around the world. However, I will go on to add that those candidates will be very unlikely to actually save the day. The mistaken policies that brought us here have all but guaranteed a big correction, one that will happen regardless of who sits in power. The natural market forces have been pushing the world towards deflation and recession and, although the establishment has managed to fight it off for Urban America, they will be powerless to permanently stop it. Surprising election results will continue to unfold, particularly in Europe. Protest and civil unrest will continue to increase. Racial and other social issues will be blamed, but the real reason will be the economy. The financial markets will break: the bond market, the stock market, or both. The recession/depression being experienced by Rural America will spread to Urban America. Trump will be blamed by the media for the crash, but in all likelihood it would have also happened under Clinton. Trump will be ineffective in pushing many of his policies through Congress and will call on Americans to turn over Congress in mid-term elections. American voters will continue to reject the establishment in mid-term congressional elections. The price of oil will continue to have wild swings up and down as it bounces between what it takes for the oil companies to turn a profit (the floor) and what is affordable to consumers (the ceiling). Due to cheap oil constraints and massive levels of debt, the economy will not recover quickly (or at all). Increased military conflict could break out in oil-rich regions, although I see the risk of major confrontation with Russia less than it would have been with Clinton. Trump will be a one-term president, unable to overcome the blame of a major recession/depression. Depending on how far into Trump’s four years major crisis sets in, a non-establishment politician smarter and more palatable will depose Trump in 2020, one that may offer an alternative vision for the future. As we get further into the story, Americans will be forced to live with less of the luxuries now taken for granted, and the Great Contraction of our society will begin. My continued advice to people is to not wait for your politicians to solve your problems. This is highly unlikely, as they will be too absorbed in trying to do what’s best for them. As there could be serious stresses on the banking system, I would suggest living frugally, saving whenever possible, avoiding paper assets such as stocks and bonds, and (if possible) diversifying into physical assets like land, precious metals, and income-producing property or businesses. We are perhaps entering a great transition from the abundance of the twentieth century into the Great Contraction of the twenty-first century. The deposing of the current political establishment is but an artifact of the broader movement to cast aside failed government and central bank imposed economic policy. The best we can do is to cleanse ourselves of our dependence on systems outside our control. Trump is playing a pivotal role in the shedding of failed systems, but in hindsight I believe historians will look back at Trump as a mistake, not because he’s the wrong man for the job, but because we failed to fix what was broken before it collapsed. ALERT: March 15th Market Crash? ← I Made Tallow Candles! Wow. This is a very informative essay that has clarified what is really going on. Thanks.